The week had some scattered storms with moderate seas. Those that went out found the fishing good. Offshore on the troll the dorado bite is picking up. 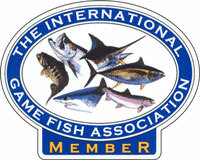 Dorado, kingfish, sailfish, cobia, bonito, and occasional black fin tuna, were in 120-450 feet. Good numbers of small dorado were in close with larger ones out further. Skirted lures, skirted and bare ballyhoo, mullet and strip baits all produced well. On the deeper drift, live baits on a kite or balloon produced good results for sailfish with sharks often taking the bait. On the reefs and wrecks, in 40-250 feet, kingfish, dorado, cobia, bonito, grouper, bluefish, yellowtail snapper, mutton snapper, mangrove snapper, spanish mackerel, and sharks were hitting sardines, ballyhoo, cut bait, live pilchards, and jigs..
Nearshore along the beaches, piers, inlets and Intracoastal Waterway had some good fishing. Bluefish, croakers, pompano, spanish mackerel, blue runners, snappers, jacks, cobia and some kingfish were along the beaches and around the piers, with some short of slot snook. Cut baits, live shrimp, pilchards, artificial, and swimbaits produced well. In the Intracoastal snook were around docks and bridges, with live shrimp and spoons sparking the better night time bites. In freshwater, the bass bite slowed in the lakes after the front came in. Live baits remained the best producer. spinner baits and top waters held their own. In the canals the peacock bass bite was good even on the fly. If you?re heading out, watch for increased Air Show boat traffic. Maintain proper distance from naval vessels offshore and in port. Stay alert for weather changes and make it a great day for fishing.